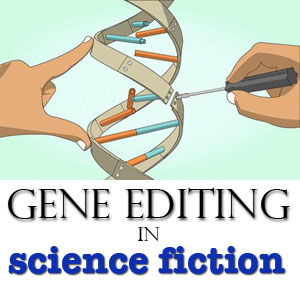 This article on human gene editing is part of the Science in Sci-fi, Fact in Fantasy blog series. Each week, we tackle one of the scientific or technological concepts pervasive in sci-fi (space travel, genetic engineering, artificial intelligence, etc.) with input from an expert. Please join the mailing list to be notified every time new content is posted. Today’s article is a returning guest post from microbiologist Mike Hays, who already wowed us with his take on the science of Jurassic Park and zombie microbiology. He’s from Kansas, a tried and true flat-lander by birth. He has worked as a molecular microbiologist for over 25 years, has coached high school sports, and is a middle grade author. Go follow him on Twitter. The plan for all living things is written in the genes. The central dogma of biology states that the flow of genetic information in a cell goes from DNA to RNA to protein. The order of the four nucleotides that make the business end of a DNA molecule codes for a gene and that sequential order of the DNA code determines the protein to be made. The proteins, in turn, provide a specific function to the cell and, subsequently, to the whole organism. Life on this planet depends on the reliability of the information stored in the DNA. As we strive to learn more about the way life operates, manipulating genes is a necessity for the molecular biologist. Cloning genes, mutating genes, transferring genes are staples of the molecular biologist’s toolbox that we use to manipulate and study genes. There have been huge strides in molecular technology since the discovery of DNA as the chemical of inheritance in 1943 and the determination of its structure in 1953, but manipulating genes for study is still tedious, time-consuming, and expensive. There’s a new tool, though, that is revolutionizing molecular biology like no other innovation since polymerase chain reaction (PCR) in the late 1980’s. The new molecular tool is called, Clustered Regularly Interspaced Short Palindromic Repeats, CRISPR for short. The start of the CRISPR path to glory began with the discovery in 1987 of repeated spacer segments of DNA in bacteria that were interrupted and clustered repeat segments instead of the typical consecutive repeat segments. In 2002, it was discovered these unique repeat clusters were associated with a common set of sequences coding for proteins that function to modify DNA. This family of proteins was called the CRISPR-associated-systems, or Cas. Three years later, the CRISPR DNA sequences were found to be similar to those of bacteriophage (viruses that infect bacteria) and plasmid DNA (closed-circular pieces of extrachromosomal DNA that are passed between bacteria). Several years later, the structure and functional pieces of the CRISPR sequences and their associated Cas proteins puzzle fell into place and the role of CRISPR-Cas was identified as an adaptive immune system for bacteria. Foreign DNA from the bacteriophage or from a plasmid invader enters the bacteria, gets chopped up, and unique pieces of DNA are remembered as part of the CRISPR sequences in the bacteria’s genome. When the same or similar foreign DNA threatens the bacteria a second time, the bacteria responds with the search and destroy CRISPR-Cas complex. The CRISPR sequence binds to its specific homologous sequence on the invader’s genome, the Cas protein cuts the double-stranded invader DNA, and leaves the foreign DNA useless and to be ultimately destroyed before it causing any damage to the host cell. After identifying and streamlining the function of this adaptive immune system of bacteria, several groups engineered the CRISPR-Cas9 system to be used as a gene editing tool in 2012. The CRISPR-Cas9 endonuclease gene editing complex contains three basic components. The nucleic acid portion containing the specific single-guide RNA (gRNA), an RNA bridge structural portion, and the Cas9 endonuclease which binds to the bridge section. The scientists discovered that, by designing and changing the sequences of the guide RNA, one can target specific genes or sequences in any genome, making a programmable targeting element to our search and destroy system. The stage was set. Now, we had a powerful tool for gene editing. For example, a researcher studying Gene X could now program the system with guide sequences specific to Gene X, synthesize this specific Gene X CRISPR-Cas9, and introduce it into the cell, where the complex will find its homologous spot on Gene X and bind. The Cas9 endonuclease will cut the DNA at a defined point of the genome. When the cell tries to repair the break, insert or deletion (indels) will occur forcing mistakes with the transcription and translation of Gene X. The resulting Gene X protein is nonfunctional and its absence can be studied. I don’t know if there has been a molecular technology that has affected the clinical/application side of medical science as rapidly as CRISPR gene editing. The last great molecular revolution, PCR, was a game changer in the research and development side of the field but took a decade before it moved into the clinical side of the field. Even then, PCR was mainly used as a screening/diagnostic tool. CRISPR is different. Discovered in 2012, it was first used in live animal studies within a year. That is a blink-of-an-eye in the normal science time frame. In a few short years, the technology has exploded to seemingly any molecular function imaginable. Plus, it is simple and cheap, which is always a promising (but unique) factor in the development of new technologies. In his recent Huffington Post article, “Top 10 Tech Trends Transforming Humanity”, Peter Diamandis, Co-founder/Vice-Chairman at Human Longevity, Inc., includes a section titled “Glimpsing the End of Cancer & Disease”. In this section, he lists ten 2016 technological advances in the fight against disease and cancer. Four of the ten involve CRISPR-based gene editing technology. From successfully treating an aggressive form of lung cancer, to National Institute of Health (NIH) approval for a project to modify the immune cells of 18 different cancer patients, to cutting HIV genes out of live animals, to curing sickle cell disease by editing out the disease-causing DNA sequences from mice, all are using CRISPR-Cas9 systems to advanced clinical treatment. That is pretty impressive for a three-year-old technology. So impressive, that the technology has caught the eye of the entertainment industry. NBC reported in October of 2016 it has signed Jennifer Lopez to produce and star in a science fiction series, tentatively titled “C.R.I.S.P.R.”. 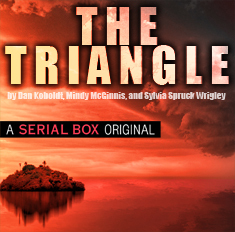 The series is said to be about the use of gene editing in futuristic bioterrorism. The field of CRISPR/Cas9 and similar complexes grew rapidly. Based on this simple search and destroy complex, scientist can mutate, modify, and swap different functional elements into the system. As we enter 2017, not even five years after the publication of the first CRISPR-Cas9 gene editing paper, here are the functional tools we now have available in molecular biology. As in the Gene X example above, use the system to edit out a gene. Cut and swap genes or add a tag gene (like a fluorescent tag) so that a target protein can be traced. Introduce a user-defined sequence change into a gene, like a point mutation. Reduce the expression of a gene without modifying the genome sequence by using a guide RNA that targets the promoter regions of the gene and a mutated, functional deactivated Cas9 (dCas9) bound to a repressor protein, like KRAB. Basically, you make an off-switch for a gene. Similar to repressing a gene, it’s also possible to Increases expression of a gene without modifying the genome sequence by using a guide RNA that targets the promoter regions of the target gene. In this case, the functionally deactivated dCas9 would be bound to an activator protein, like VP64, to make an on-switch. One of the coolest aspects of the technology is the ability to use a light or chemical sensitive activator protein that is fused to the CRISPR complex to act like a switch. If one wants the CRISPR activity, perhaps silencing or activating a gene to occur at a specific time in development, just flip the switch! Mess with the DNA sequence, mess with the protein, mess with the organism. So what does all this gene editing stuff have to do with science fiction? Yes, potential. With gene editing and science fiction, it’s like Dr. Bellen says, “Everything is possible…” As a writer of science fiction, what is better than having a logical, powerful and incredible piece of actual science that can open story doors and allow the manipulation of any living thing? If you want to get started, here’s a link to an excellent short video about DNA basics from the Genetic Science Learning Center at the University of Utah. They also have a nice tutorial page about making proteins from the DNA code with some cool stuff about the effect of mutations. As with most things, CRISPR gene editing is not perfect. It has a dark side. Off-target effects. 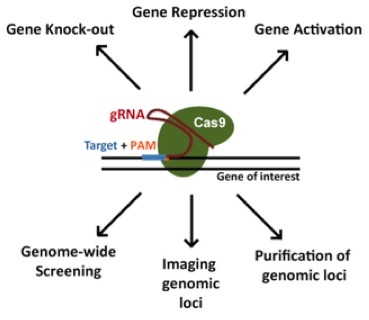 These off-target effects occur when the CRISPR-Cas9 search and destroy complex binds to the genome at a secondary target site where it is not supposed to bind. Although, there have been recent advances in minimizing off-target effects, they still hinder the advancement of this powerful technology. 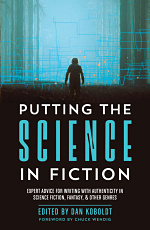 But what is a bane for scientist can be a boon for the science fiction author. Where off-site targeting can cause effects that ruin my experiment, maybe these effects can result in a great twist for my sci-fi novel. How about the formation of sentient strain of lab rats that form an alliance to protect their lab animal care worker from funding cuts and layoffs? Or a strain of edited soybeans that shows great protection from Fusarium root rot but after a generation switches to rapid and uncontrollable growth that overtakes the central plains? There is great potential in the dark side of science. Next time you are thinking about your science fiction and looking to add a bit of pizazz in the form of a genetic twist, remember the power of gene editing. And never, ever shy away from adding a little science to your science fiction. Wonderful article, Mike. Thank you so much for this!